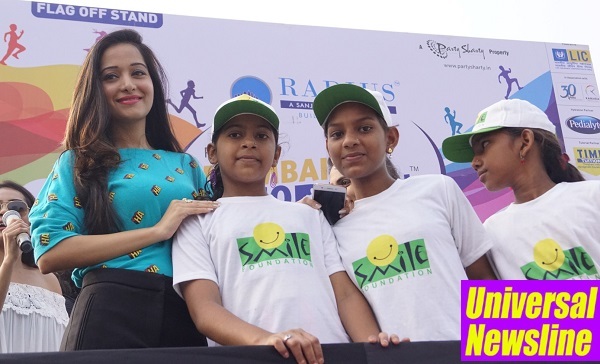 Model and Actress Dipannita Sharma and Claudia Ciesla graced Mumbai Juniorthon on Sunday in Mumbai. It’s a third edition of running event for children & junior athletes in Mumbai which started in 2015. JUNIORTHON is all about Mumbai children running towards a healthier future and supporting a good cause. The goal of JUNIORTHON is to encourage outdoor activities and physical fitness amongst children by giving them an opportunity to accomplish the goal of running. Talking about Juniorthon Claudia said, “I am fitness enthusiast myself and I like to motivate people and encourage them. I feel it is really necessary in our daily life for children as well as adults to be healthy and exercise regularly. I am feeling really happy seeing all these kids early in the morning and, I feel we should also appreciate their parents for supporting them and bringing them here early in the morning, so I feel whole atmosphere here is really wonderful. TATA Motors has been associated with Mumbai Juniorthon 2017 as their official 'Safety Travel Partner', SMILE foundation as NGO partners among others. Portion of earnings from Mumbai Juniorthon is donated to SMILE foundation for the welfare of underprivileged children. Mumbai Juniorthon is organised by Party Sharty Entertainment Pvt Ltd. every year, under the guidance of Bhavna Mehta and Amit Mehta.